As technology is transforming rapidly, the incorporation of technology in day to day life has increased too. Technical innovations are poised to change the world forever where augmented reality (AR) and virtual reality (VR) are jointly making it operational. The worldwide revenue of the growing market of AR/VR technologies is estimated to increase by 100 per cent or more in the next four years, according to the IDC report. Therefore AR/VR technology has a huge prospect in the market and has the potentiality to surpass the popularity mark of the smartphone. Considering the popularity and potentiality of the technology, many deem it as a viable career option, remarkably similar to software developer or software engineer. As hardware developers make AR and VR more affordable and user-friendly, startups are developing new use cases far beyond gaming — applying the technologies to everything from marketing to healthcare to space exploration, and more. From real estate to the military to healthcare, architectural, and engineering are developing AR/VR applications across several areas. Obviously to be well acquainted with the technology knowledge on several computer programming languages including common syntax, basic understanding of UX (user experience) design and the hardware applications are required. Believing the limitations and requirements, Pixel Academy has designed a course accordingly, as knowledge is the key to unlock new avenues. 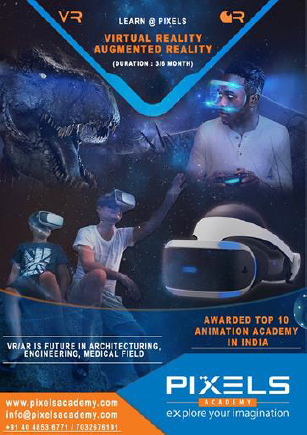 Pixels Academy is one of the top 10 ranked academies in India for animation, gaming, and visual effects, has launched a high-end VR and AR course for students who want to shape their career in the magical yet promising world of AR and VR. Students may also enroll in AR and VR certificate course to learn bits and bytes of the latest VR/AR technology and get started with their career. These courses offer complete hands-on experience to the students by providing more practical examples/projects in two months of internship within the course, to make them prepared for industry practices. Pixels Academy started their journey with a vision to provide world-class training to students in the fields of special effects, animation and gaming, thereby equipping them with the latest knowledge and skills needed to be readily absorbed into the industry. In its years of operation, Pixels Academy has established itself as a prominent member in AVG training domain by offering more industry-specific courses. The academy has a proud alumni group who are currently working on national and international projects in various studios. 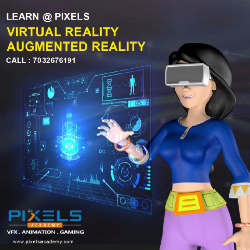 Pixels Academy has the course specialised for students in creating AR and VR solutions, which focuses on defining the workflow for AR and VR, designing the content and deployment-related task. From this course students will get the opportunity to use and experience many of the leading technology tools for VR content development, like Google VR, HTC VR. With the designated course students will initiate their journey by learning from the very basics to advanced intricacies of the technology including the aspects of VR and AR design pipeline. As a part of entire learning in this course, each student will work on a hands-on project in their two months of internship period and earn their certificates. The project will also help the students to have a strong design portfolio in presenting to potential employers. After successful completion of project and assignment, students will earn a Pixels certification which they can share with prospective employers and in professional network and they will be eligible to take advantage of their placement assistance program. This followed by the Pixels placement program will help the student to connect them to potential employers and get them started in the VR industry. You can be an enthusiast, a skeptic, or somewhere in the middle, 2019 is going to be a big year in figuring out the real potential and opportunity around AR/VR technology and Pixels Academy is the initial footstep.